In my book rain is just rain. Many people find the scent of after rain is pleasant . I have no instinct until crush in my holiday. 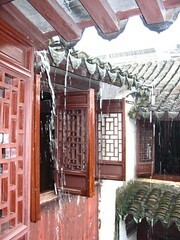 Rain is traditionally sad and negative connotation to Western world. Contrast to the bright and happy sunny day..All attitudes towards rain differ across the world. If you have drought in Africa..What will you think about the rain drops? Where ever you live you'll draw..raindrops are tear-shaped.Round at the bottom and narrowing towards on top.If I am not correct you will draw flying arrows came down. Why we are negative about rain?